"Sat", means that which exists forever and is in everything and everywhere. Thus, it is the Supreme Soul which remains immortal. Like God who has the power to burn our sins to ashes, even truth, like fire, has such power. Although there are several bad qualities in us, we must make up our mind that "I will not speak falsehood. I always stand for truth". If purifying seeds are dropped into the muddy waters, they will absorb the impurities and purify the water. Likewise, the one virtue of telling the truth will rid humans of all bad qualities. It is the mind that does many bad things than our actions. Though we invite a guest, in the mind we think 'this fellow has come now and might not leave without having food'. Speaking truth is like unlocking the heart and so we should give up bad thoughts. Thus, a good thought gradually increases the right action and determination and removes all the vices from us. 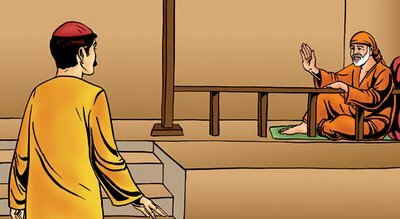 Baba resisted the evil-minded from entering Dwarakamayi. He is Omniscient and can read the thoughts of everyone in any corner of the world. However, being the Merciful Father, Baba dispels the evil forces from devotees' hearts, before taking them closer to Him. Siddique Phalke is one such example. If we enthrone truth in our hearts, Baba showers His love.